So, for pretty much my whole life, I’ve been stuck in my own cocoon of sorts when it comes to watching films. I would only watch a film if it had action sequences that seemed cool, or some type of lasers which, I have to be honest, I probably should have outgrown by now, but I haven’t. However, there is one film recently that really helped me take a step in the right direction in terms of a film that has little action shown on screen. It’s simply the context, meaning what we already know about World War 2 trench conditions, that is enough to interest the audience throughout this film, as well as the political warfare that keeps you on the edge of your seat (despite knowing the outcome of the war). So what is it that really entices the audience throughout? Could it be the deep, thought provoking tone of the music played in the film? 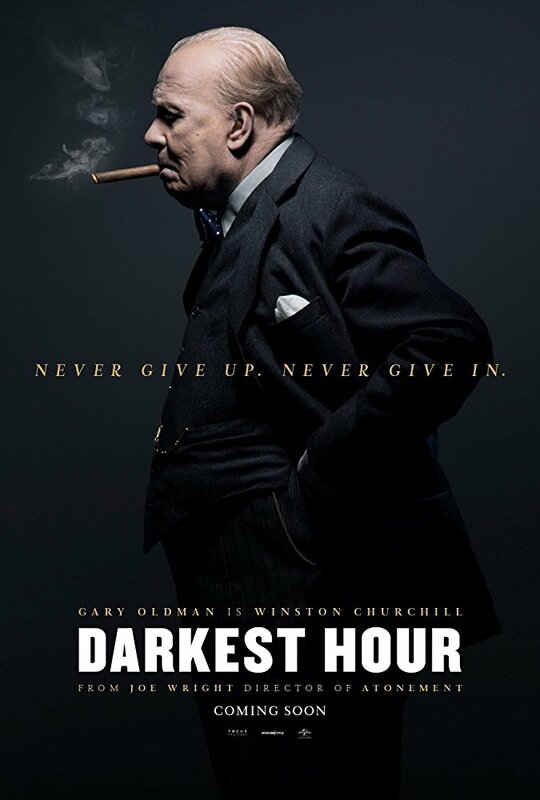 Is it Gary Oldman’s tremendous portrayal of Winston Churchill, or could it really just be that we learn to appreciate Churchill more by learning more about his persistence during this “darkest hour”. Well I believe it could be all these things and more, allow me to expand on this thought. So the film starts with us learning that, in 1940, after Labour insists that Neville Chamberlain resigns as leader, he tells advisers that he wants Lord Halifax, the foreign secretary (whose role is to encourage diplomacy among its own and other countries), to take his position, as he is a leader that other parties will accept. However, Halifax doesn’t want this position at the time, so they’re forced to put Winston Churchill’s name forward and they later agree on party electing him. When they do this, they don’t realise that Churchill didn’t intend to negotiate any terms of surrender with the Germans, despite the fact that they had surrounded the British forces at Dunkirk. 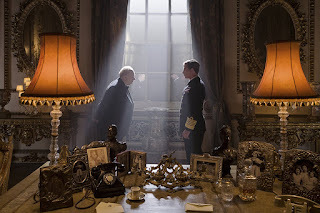 The film clearly brings to life the confrontation between Lord Halifax and Churchill, which was known as the Cabinet Crisis. We also get a real feel for the persistence of Churchill, a man who dealt with the continual loss of soldiers every day, and we see him as, not simply a man who looks at a map and sees a few dots moving towards his, but as a man who recognises the threat and the risks while keeping pushing away the government he is serving, in consideration of the people, and what they may have to endure, if they surrender to the German army. Even in the moments where men such as Halifax, and almost everyone else in the House of Commons, all agreed that it was almost pointless to keep fighting, Winston kept pushing, and coming up with new ways to surprise everyone, whether it be by getting trapped British soldiers out of a difficult situation, or reaching the point where even he was considering the terms of a surrender. But what really changed his mind, and helps the audience to realise the strength of the true people of any nation, is that its leader needs to be the voice of those that matter, which are the average man woman and child that will benefit or suffer from whichever conclusion they come to. 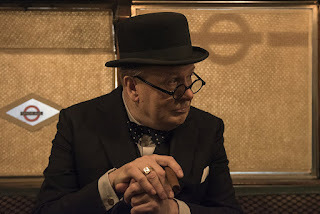 And Churchill, feeling defeated, and unsure of himself, decides to take the train to get to Parliament, in order to get a little perspective from the people, before partaking in the meeting, that would question the future of Britain, by putting it in the hands of Germany. He learns from these people that they believe that their country should not be under the control of any government other than its own, and that they, in his situation, would not back down, and the true importance of this moment, is that Churchill writes down the names of these voices, to give them a significance in Parliament, to show that they are important, because they are the true people of Britain, whose opinions matter. They represent the democracy that Britain is supposed to be, and we see the strength of that belief in Churchill when he uses their opinion to strengthen his resolve and to continue to fight, no matter the cost. As the people themselves even said, the cost of victory, and the fact that they say that the cost is far better than what would be lost through a surrender, this shows that they are represented through Churchill when he speaks his beliefs in the Houses of Parliament. This leads him to speak with a voice that has others to back it up, and that is the strongest kind of voice. This would be the moment when it was decided that Britain would not lose the war, and it was even at the point where the King agreed with Churchill, that they could not surrender, and it was this amount of support, that would end World War Two, with the side of Britain being the victors. Two days after he decided to not attend this meeting of negotiation, he made an announcement in Parliament, that would encourage many politicians that they cannot give in to Nazi Germany and if, there were ever a stage where any part of the country were “subjugated and starving, then our Empire beyond the seas would continue the struggle” until the “New World, with all its power and might, steps forth to the rescue”. What would really make this speech powerful, at least to me, is the fact that this final line was true, in that the U.S would later step in and help Britain to end the war. These powerful lines, once spoken by Churchill, would earn Gary Oldman his long overdue Oscar award win, bringing across the true determination and persistence that Churchill felt at the time of this speech. 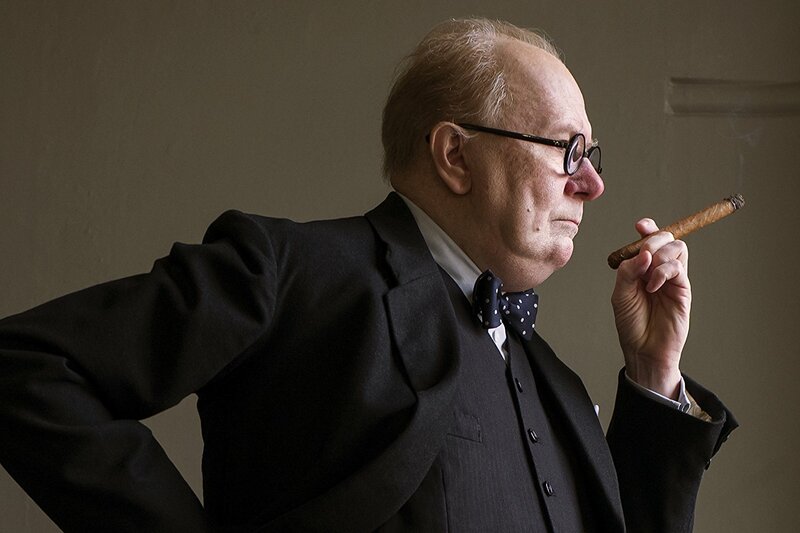 Gary Oldman’s performance of the character was of course, exceptional, I honestly didn’t even know that it was him playing as Winston Churchill when I first watched the film, and when I found out I was particularly surprised and impressed. 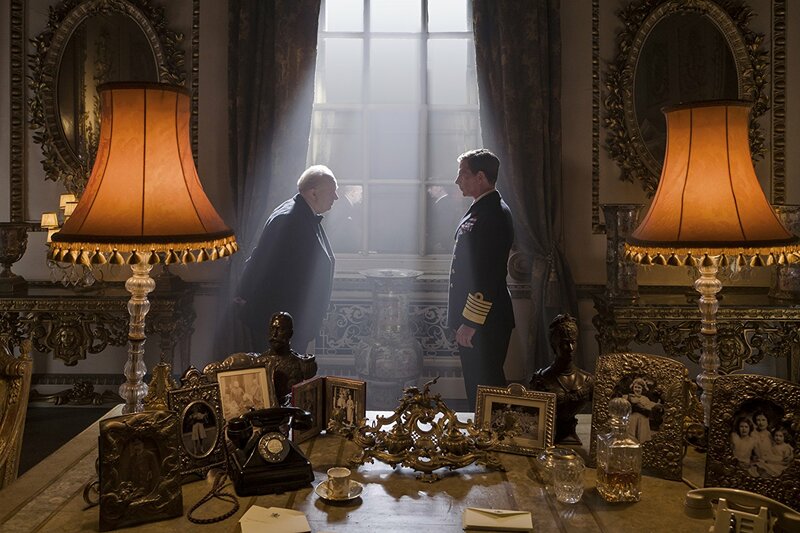 The speech at the end really helps in giving a patriotic spirit to the film, through Churchill, as of course, he brings across the idea that Britain is a country that never gives up, and that we will continue fighting “on the beaches” and wherever necessary to achieve victory. At one point in the film, Churchill brings across that he’s almost driven mad by the loss of life and is tempted to give up. 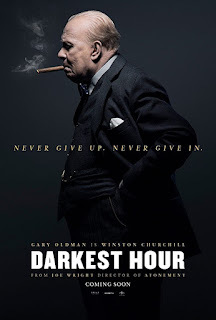 Gary Oldman brings this across perfectly and really helps the audience to see the struggles that Churchill faced, as he wasn’t just fighting the Germans and his own government, but also himself, as he was trying to convince himself that he was doing the right thing. 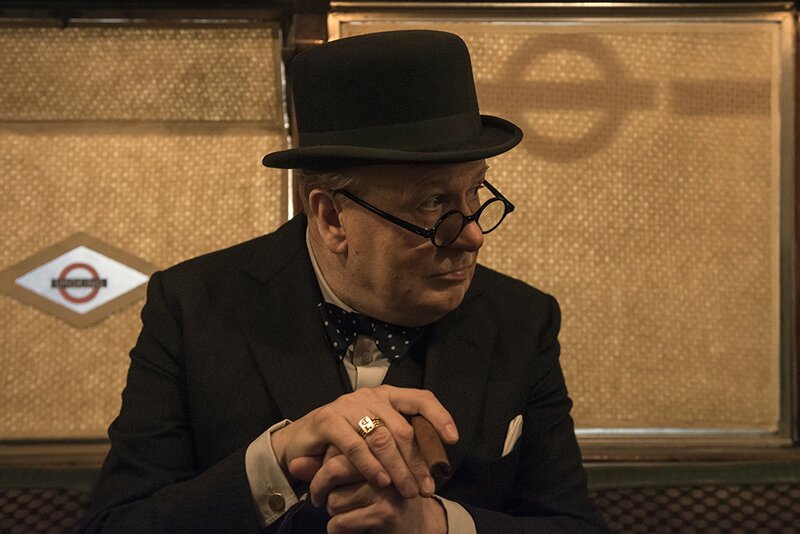 In a lot of ways, Oldman bring across a lot of Churchill that we don’t hear Churchill himself say in a lot of his recorded speech broadcasts. He helps us to realise that Churchill was indeed a man struggling with his morals at points in the war, and as he starts to doubt himself, you as a viewer also start to as well, and we start to see where the other members of parliament are coming from, and the tremendous loss of life makes you question him. Until of course, he gets the motivation he needs to keep fighting. The idea of Operation Dynamo, as the Dunkirk evacuation plan was called, is what also helps us to back up Churchill, as he is also secretly helping to save more lives behind the scenes in a way, and it was through the success of this operation, that 300,000 soldiers were saved on that day, giving the continued significance of his efforts in the war. This would also help to argue against the idea that Churchill was simply mad for continuing to fight, and simply didn’t care about the loss of life, it’s this operation that proves otherwise, as well as the emotions we are given in the film itself. The struggles we see him face in this film, and the mental issues that he deals with are almost relatable. Of course in our everyday lives we don’t deal with as much a loss of life as they did at the time, but his emotions of struggling through hardships are what people suffer with now with their everyday lives, this proves that Winston does represent the people, in both the positives and the negatives. Another highlight of the film for me is the feeling conveyed by the music soundtrack. Even the prelude soundtrack of this film seems uncertain, not following any direct tone, being neither incredibly dark nor incredibly happy, the varying pitches bring across the uncertainty and moods of those in power at the time, as they clearly felt both uncertain and distressed on the difficult decision that they were faced with. The Where is Winston track is particularly strong, as it varies in pitch also, but at many stages is quite high, with a certain patriotic style to it, almost as if people want to know where he is, because they now rely on him for guidance, and it’s not just a search for the Prime Minister, but a search for guidance and hope, and (although my memory doesn’t serve me entirely well) I believe this scene is one in which Churchill knows that he needs guidance, which is why he has ran off in search of it, through the King, and through asking the people, making these moments in the film stronger, and more significant to the plot. But the strongest soundtrack of the whole film, to me, is the “We Shall Fight” track, that really represents the sombre mood of the Government in the beginning, but as that final, most important speech continues and escalates, so does the music, and those in Parliament become encouraged to keep fighting through Churchill. They start to agree with him that they cannot give up and, of course, it’s because we didn’t give up that the British did eventually fend off the German army. It would be through the continual persistence, and the assistance of the U.S army, following the bombing of one of their harbours, that the war was eventually won, and it is possible, that if the British had surrendered during this hour, with them being the only opposing force at this time, the war would have been lost, making Winston Churchill one of the most important leading figures in Britain’s history. Overall I think that this film is strong in that it not only provides a strong soundtrack that brings across the highs and lows of the time of the war through both Winston, the rest of Parliament and the British people of London, but it also challenges Oldman’s style of acting, as we often see him in roles involving action films, science fiction, and crime thrillers. Of course he is no stranger to doing a historical drama or two, through films such as JFK, in which he plays the villain who supposedly killed John F. Kennedy, but this film is clearly different because it flips the coin and portrays him in the style of a significant leader, who helped to turn the tide of a war that, at one point, seemed as if it couldn’t be won. This is why I would recommend this film to anyone, even if they have little interest in history, as this film is likely to get you interested, as it appeals to the human inside anyone, helps you to realise the struggles of those heroes that lived and died before us, and helps us to appreciate them, and realise the difference that one person can make, in order to change the world.